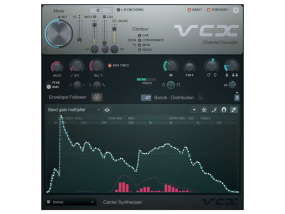 Info über "Image Line Vocodex Plug-In FL/VST - ESD"
• Speech enhancement contouring of noise or modulator pass-through. • Modulator noise reduction to reduce ambient noise bleeding through carrier. • Voice doubling and reverb capabilities. • Built-in Soundgoodizer for limiting and warm output. • Up to 100 bands individually locatable anywhere in the spectrum. • Band unison to create a fat & lush sound. • Sidechain carrier & or modulator input. • Inbuilt carrier synthesizer powered by Sytrus. Weiterführende Links zu "Image Line Vocodex Plug-In FL/VST - ESD"